Fenerbahce striker, Robin van Persie, escaped a career-ending injury, after he was taken off with a bad eye injury, during their 3-1 win over Akhisar on Sunday. The former Manchester United and Arsenal player, opened the scoring for his Turkish club, but was stretchered off before half time. Van Persie went down in distress, after he was caught by the flailing arm of an opponent. 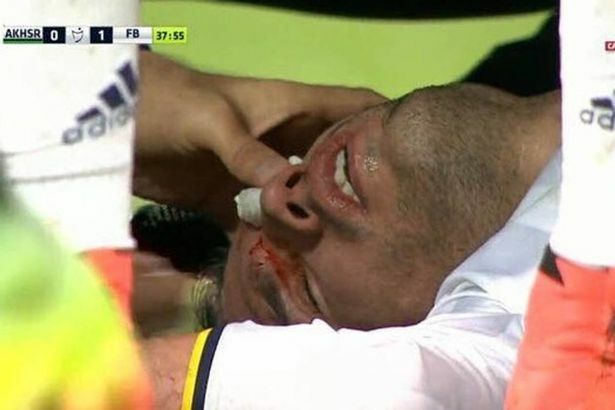 The 33-year-old was bleeding from his left eye, which was treated before he left the pitch in an ambulance. As soon as images of the incident appeared on social media, many fans began to fear Van Persie had been blinded and would never play again. But he returned to the game with a bandage over his eye, to watch his team-mates take all three points. The club doctor later told the club’s official website, that the player had torn his eye-lid but not suffered any damage to the eye.